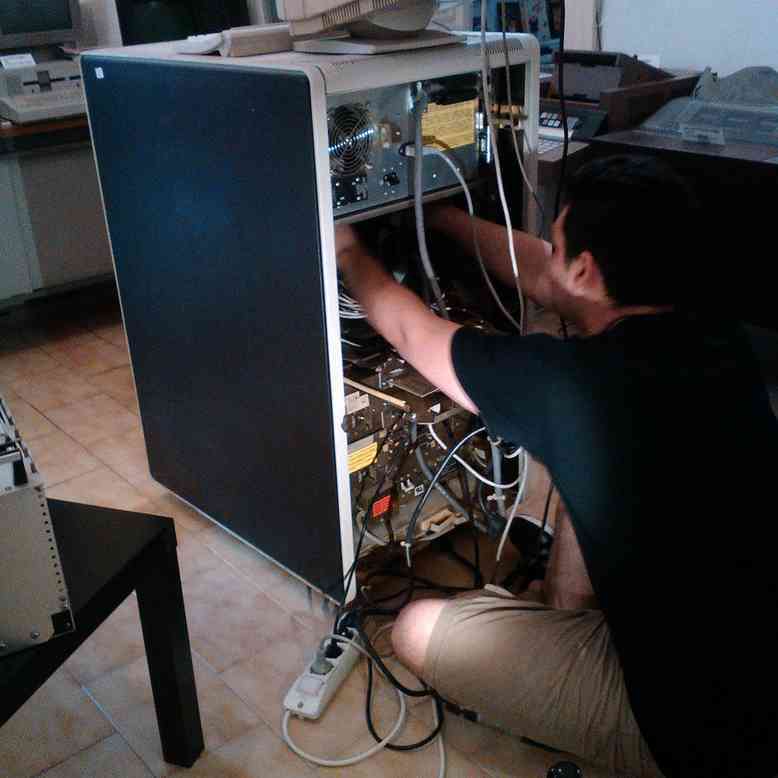 We saved this PDP11/23PLUS some years ago in Pescara, thanks to Alexander “Smilzo” Gnoli. It was an incredible trip with a camper, with Giuliano “Vampire”. We filled a lot of hardware inside our Fiat 242 camper, and eventually stored everything in our deposit. First analysis revealed the main problem: power supply was searched for parts / missing. This power supply was necessary also to generate a particular 60Hz clock needed for some operating systems. We searched for some time and stored the computer again. Two years ago, with Andrea “mancausoft” we considered the idea of adapting a common ATX pc power supply, creating a circuit for the 60Hz clock. We were thinking about creating it from our 220V power line (at 50Hz), but we were in a hurry and had to store the computer again. One year ago, we built a prototype adapter to connect the ATX PSU to our PDP11/23PLUS, with a programmed ATtiny85 to generate the needed clock (a particular choice: instead of creating it from 220V, we decided to use the ATtiny85). Test was succesful, but the system was stuck on boot. We were out of time to do a complete debug so we had to store the computer again. Recently Andrea made the final adapter board, the one that you see in the following pictures. We finally tested and mounted everything; system power on correctly, memory test is ok, but we receive an error on the RL02 boot unit.